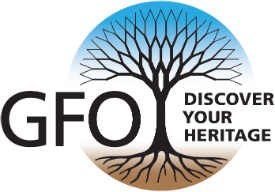 Only once each year, the GFO asks members to raise funds. The GFO is 100% volunteer. No paid staff. No paid fundraisers. Member dues cover only 24% of our budget. Help us to preserve history so more people can discover their heritage. Fill in the form below. Click on the Donate Now button. This page has been encrypted to ensure the safety of your financial information. Enter number in this format, e.g. 1000 or 10. Do not use the $ symbol. To cover bank fees, GFO requires a minimum $10 donation when using a credit card. NOTE: Please indicate in the Comments field if the gift is in honor of or in memory of someone. Named gifts are published annually in the Bulletin. 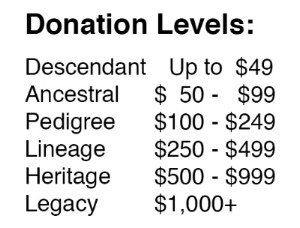 Please limit each gift to one individual, family, or other entity such as a group or organization. The GFO does not trade, sell, or, otherwise share donors' information. Please let me know how to include the GFO in my estate planning. I have included the GFO in my estate plan.